Outdoor weddings are romantic and scenic, but there’s a lot that can go wrong. 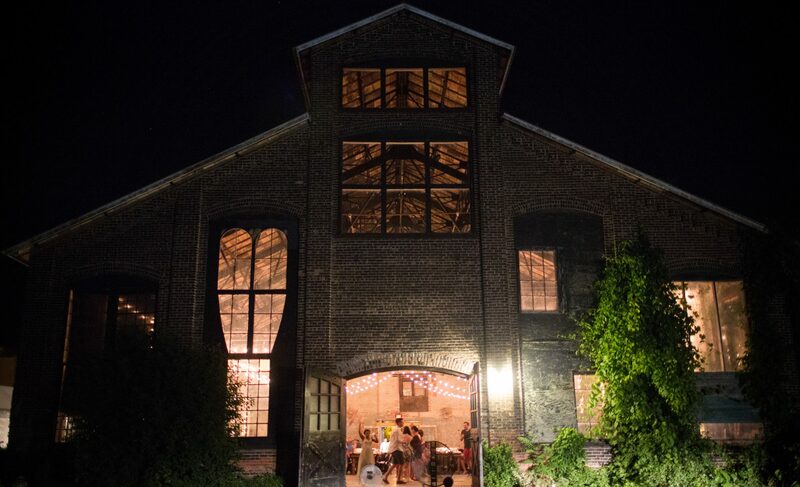 Here’s your guide to planning a trouble-free, outdoor wedding. Some officiants will only perform ceremonies within a house of worship, so you’ll need to check with yours in advance before planning your ceremony outside. Guests need to know they’re attending an outdoor wedding so they can dress appropriately. It’s also a good idea to send weather information to out-of-town guests who may not be familiar with the climate. For an outdoor wedding, the draw is the setting, so finding the right spot and coordinating the event around it is the most important task on your to-do list. Your setting options are as limitless as the great outdoors itself. But before getting your heart set on a specific spot, these are some key questions you’ll need to ask. Keep in mind that if your location is a public space – or even near a public place (like a street or sidewalk), you may have to contend with onlookers. Try to reserve your space in a secluded spot to prevent unwanted guests or distractions. Obviously you’ll need a plan in case of inclement weather. If your location doesn’t have indoor facilities to accommodate your event should the skies open, you’ll need to rent a tent. Many rental companies will reserve your tent for a deposit and that way, if the weather is nice and you don’t use it, you don’t lose the full payment. Will guests have to compete with roaring waves, gusting winds, honking cars, or screaming children to hear your vows? You may need to rent a sound system and mics for the officiant and yourselves. Your band or DJ should be able to provide this for you. Let the setting speak for itself – Don’t compete with Mother Nature; rather, subtly enhance your background (whether it’s a sandy beach, blooming garden, or thick forest) with a complementary color palette and décor elements. Au Natural – Consider details like burlap table linens and vintage furniture to set your scene. It blends into the outdoor setting while also creating a statement. 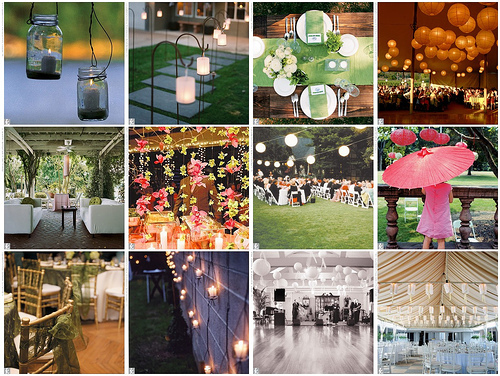 Get inspired by the vintage gems available from Found Vintage Rentals. Lighting – Create ambiance in your outdoor space by getting creative with your lighting – there is nothing quite like bistro lights, twinkle lights, or lanterns set against a natural scene. Blooms – An outdoor wedding calls for flowers that can brave all sorts of weather. Look for sturdier blooms like mums, orchids, carnations, alstroemeria, lisianthus, calla lilies, and sunflowers. Also, don’t overlook these hearty, simple floral embellishments that look fabulous by themselves: baby’s breath, bells of Ireland, hypernicum berry, bupleurum, and dusty miller. Style – Keep your containers and arrangements natural-looking, as an intricately designed, elaborate pedestal centerpiece in a tall candelabra just doesn’t fit. Instead, use loose arrangements in mason jars, wooden boxes, vintage containers, crates, or pails. Keep it simple – Even an elegant outdoor wedding calls for simpler fare that can withstand varied temperatures, so avoid items like mayonnaise or dishes which must be served cold. If yours is a casual affair, consider a traditional outdoor barbeque. Keep guests refreshed – Have plenty of ice and water, along with teas or lemonades, especially if your outdoor wedding will take place in a warm environment. Alcoholic beverages like sangria, mojitos, or mint juleps will also keep your guests refreshed. 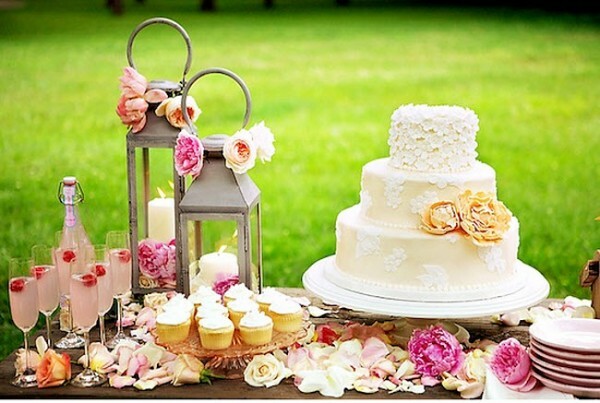 Make it last – Wedding cakes can melt outside. Opt for fondant icing over buttercream. Stay away from mousse and ice cream cakes. Many types of cupcakes hold up well in the heat. Bride – Dare to go casual. Outdoor settings allow for breezy fabrics and shorter hemlines. Knee and tea-length gowns are making a major comeback, while lace and/or organza are good outdoor fabric options. But if traditional elegance is what you prefer then you can still plan a formal dress code – just consider what’s best suited for sun, sand, or grass. Bridesmaid – You may want to forgo the giant ball gown and instead, stick to a romantic empire or a-line dress in a flowing organza or light-catching taffeta. Shoes – For both bride and bridesmaids, opt for a wide, flat heel, cute ballet flats, or strappy sandals, as a stiletto may sink right into the ground. For the guys – Lose the tux and consider an unbuttoned affair. Dress the guys in khakis and sport jackets or crisp oxfords. If you’re heart is set on a tux, get a vest with a full back – which will look better when their coats are off. Keep ‘em cool – Personalized paper fans are both decorative and functional. Keep love blooming – By giving packs of flower seeds. Plant it – Gift them with miniature potted plants or herbs. Give – Forgo the traditional favors and donate to your favorite “green” organization in your guests’ names. Sail away – Make your exit on a sail boat, yacht, catamaran, or canoe (hint: you’ll need a body of water). Horseback – Make sure you practice before you galloping into the sunset. Vintage Flatbed Truck – ‘Cause you’re a down-home couple at heart. Horse-drawn carriage– This romantic exit is the ultimate departure fit for a princess. 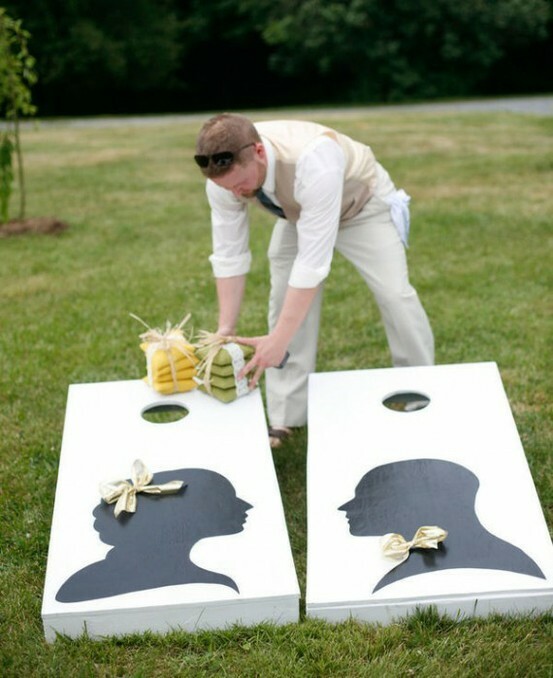 Fun and games – In a natural outdoor setting, you’re not limited to a traditional band or deejay to entertain the crowd; outdoor games like horseshoes or croquet can be a fun and unexpected twist. Public outdoor locations require numerous permits and fees. Be sure to find out about any restrictions on noise, alcohol consumption, number of guests, food preparation, tables, tents, and time limits. Keep in mind that you’ll have to rent everything – from tables and chairs to bathrooms and sound systems – and these rental fees can up your bottom line. 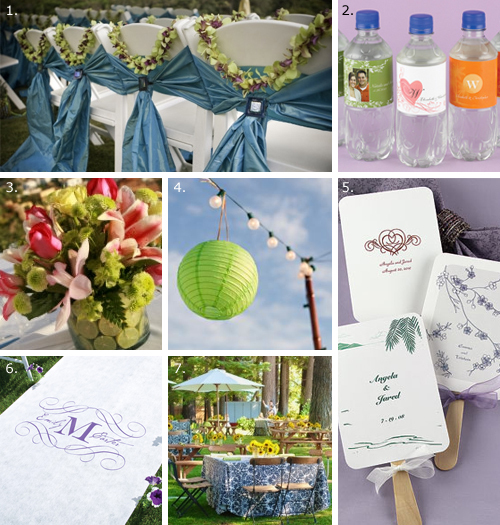 Attention to detail is key to the success of an outdoor wedding. Coordinating the permits, rentals, backup plans – not to mention the typical wedding details – can be taxing. Seriously consider enlisting the help of a professional coordinator to keep things together. Is there convenient parking? If not, you’ll need to secure a nearby lot and provide a shuttle – especially if you’ll have elderly guests or others with limited mobility. Outdoor weddings are a prime candidate for insurance, which will to help recoup losses caused by extreme weather conditions or any other circumstances that prevent your wedding from taking place.